Dr. Phil Zeltzman is a traveling, board-certified surgeon in Eastern Pennsylvania and Western New Jersey. His website is www.DrPhilZeltzman.com. Phil has more than 20 years of experience in the veterinary industry and is traveling, board-certified surgeon as well as a founding member of IDEXX’s Pet Health Network team. He graduated in 1993 from the University of Liege, School of Veterinary Medicine in Belgium. He is a board-certified surgeon - a Diplomate of the American College of Veterinary Surgeons. Dr. Zeltzman has wanted to be a veterinarian since the age of 5 when his favorite TV shows were Flipper, Daktari and Lassie! "Becoming a surgeon has been a dream come true and I am as passionate about my profession as I was when I first started," he says. Besides surgery, he has a strong interest in the prevention and treatment of overweight and obese pets and their people. Dr. Zeltzman has just published "Walk a Hound, Lose a Pound," a book on weight-loss in dogs and people, co-written with Rebecca Johnson PhD, RN, FAAN (http://www.walkahound.com/). 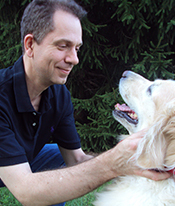 As a Certified Veterinary Journalist, blogger, columnist and award-winning author, his goal is to write meaningful articles, newsletters and books that will make a difference in the lives of pets and their people. His web site is www.drphilzeltzman.com.